Quite simply, a wack is your experience. Your wacks–and the wacks of all our users-are the core of the Wacktrap site. Your wack can be as brief or as detailed as you want to make it. Remember: the more detailed your wack is, the more keywords it'll contain, to increase your odds of being seen. Optionally include everything related to your experience, like photos, video clips, the related url web address, even pdf documents. So if you've got 'em, flaunt 'em: attach all four types to make your wack even more seen! It’s easy to add a wack now: we'll give you a place for everything you need, including specific spots for the stuff to make your great wack even better, like that unbelievable pic or video clip. You'll need a caption for that wack. A great Title means members will find your wack quickly and easily. It's mighty important, so we'll show you how to create a fantastic wack Title. Even add a pic, video, url address or pdf document to add some glam to your wack and increase your odds of being promoted to our homepage. Your wack is what other users are rating-using those seemingly small mallets that actually mean big, big things. 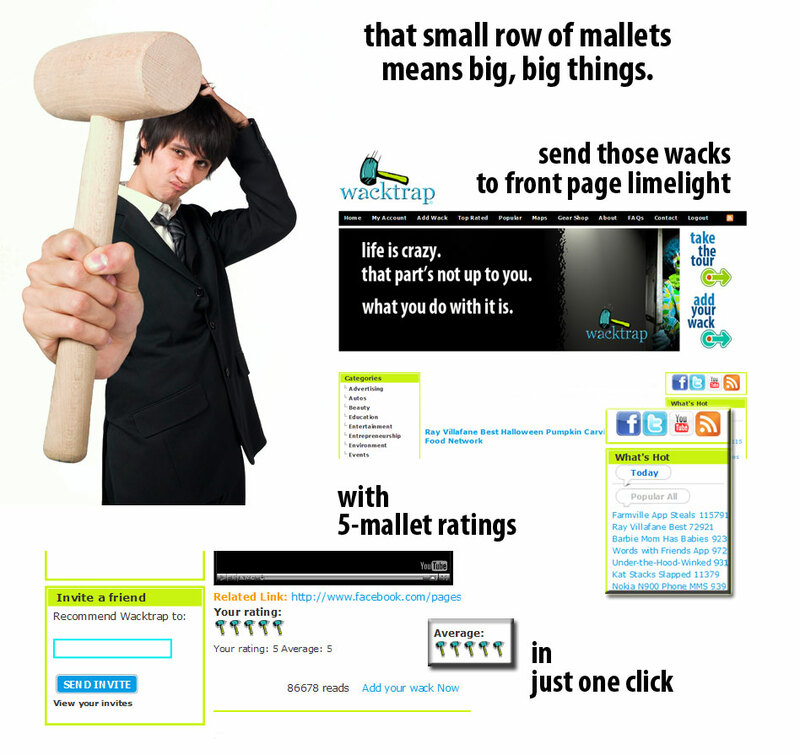 If your wack is ‘wack’ enough, and worthy of ‘5-mallet’ Ratings, it’s being actively pushed into the ultimate limelight: the Wacktrap front page-for the whole world to see. Wacktrap users, and you, can also Comment on your wack at any time. And those Comments have got longevity-they stay with your wack for its lifetime. Permanently attached to the base of every wack, Comments always follow. We know you want to get started. We'll show you how to add your wack now!